Sylvie, that luscious soup with the crispy chorizo on has my mouth watering! Lovely stuff. WOw, looks and sounds so delicious with the squash, sweet potatoes and chorizo! I am totally saving this recipe for when the weather cools down here! It's certainly cold enought for soup today! Yum! butternut squash that's been hanging around my kitchen for at least six weeks!! I bought it then didn't fancy it! Great soup - I will give this a go before my poor butternut squash dies. 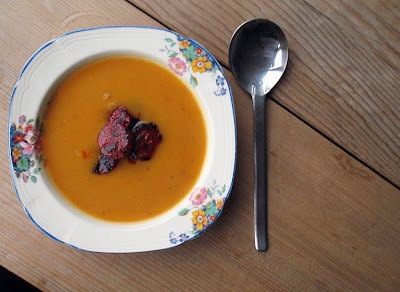 butternut squash and chorizo are a fantastic combination, the soup looks and sounds delicious! Great looking soup Sylvie. I just did a roasted veg soup to send to a sick friend. I am betting the addition of some chorizo would have gone down a real treat! Anything with chorizo wins it for me! I did a spicy parsnip soup with chorizo a year or so ago - much the same effect, I imagine. Yummy! Louise, I should have put chili flakes not red pepper flakes (I'll correct that). Sorry, they are just the ordinary ones you can get in any supermarket. Schwarz do them. Alex, thank you so much! I made your soup a few nights ago and it was superb! I used soy chorizo because we are vegetarians and I substituted white potato because my husband is anti-sweet potato. Nevertheless, it was insanely delish! I look forward to trying your other recipes.